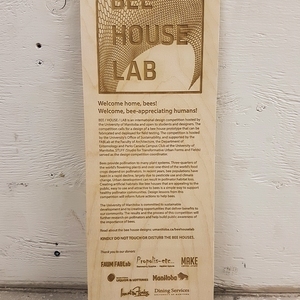 BEE / HOUSE / LAB is an international design competition hosted by the University of Manitoba and open to students and designers in the field of environmental design, architecture, landscape architecture, industrial design, and related fields. The challenge? To design a bee house for fabrication and deployment that can house 80-100 solitary bees, a species under threat from loss of habitat. The winning creations showcase excellence in sustainable design and innovation, and are being used and studied in locations across the university campuses and in the community. Teams from nine countries (Colombia, Canada, USA, UK, Germany, Italy, Norway, Poland, Brazil) submitted their proposals to the BEE / HOUSE / LAB competition and a Design Jury determined winning designs in both open and student categories. 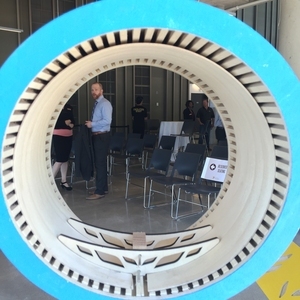 Approximately 50 houses have been created from the winning designs and have been deployed around U of M campuses and in key locations around the City of Winnipeg. 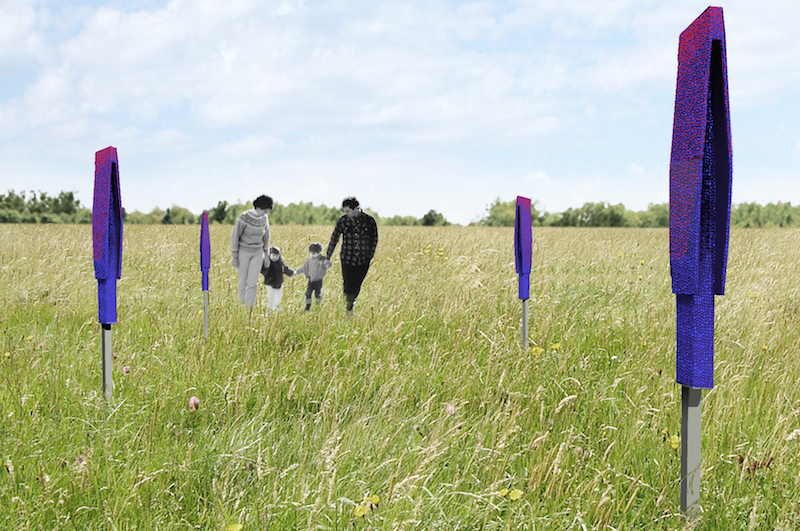 The designs are accompanied by interpretative signage which gives background on the project and connects the project to the impact it can have on our daily lives, our communities and the world. These designs are being field-tested to study their space-form-habitat performance. The competition was hosted by the University’s Office of Sustainability, and supported by the Faculty of Architecture’s FABLab, the Environmental Design program at the Faculty of Architecture, the Department of Entomology in the Faculty of Agricultural and Food Sciences, and the UM Parks Canada Campus Club. 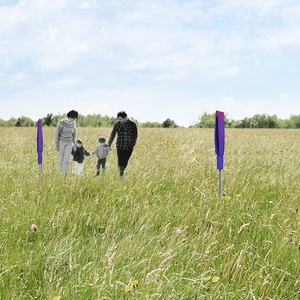 STUFF (Studio for Transformative Urban Forms and Fields) served as the design competition coordinator. The University of Manitoba is committed to sustainable development and to using campus as a living lab. The results and the process of the competition will be published on various forms of media for the ongoing BEE LAB research and for the public awareness campaign purposes. Bees provide pollination to various plant systems. Three quarters of the world’s flowering plants and over one third of the world’s food crops depend on pollinators. In recent years, bee populations have been in a rapid decline, largely due to pesticide use and severe winters brought on by climate change. One of the key goals and objectives in the U of M’s recently adopted Sustainability Strategy is to “plan for biodiversity; prevent, manage, or remediate damage to natural habitats and sensitive areas” (p. 26). Guided by this strategy and prompted by discussions with community partners, the Office of Sustainability wanted to do something to support pollinators, specifically bees. Like many people, we had heard of the difficulties honey bees face because of the factors named above. However, when we approached a professor in the Department of Entomology, we discovered that there are many species of bees that we rely on for pollination and some, like solitary nesting bees, are at risk because of loss of habitat due to urban development. Creating artificial habitats like bee houses that are appealing to the public, easy to use and attractive to bees are a simple, accessible way to support healthy and resilient pollinator communities. 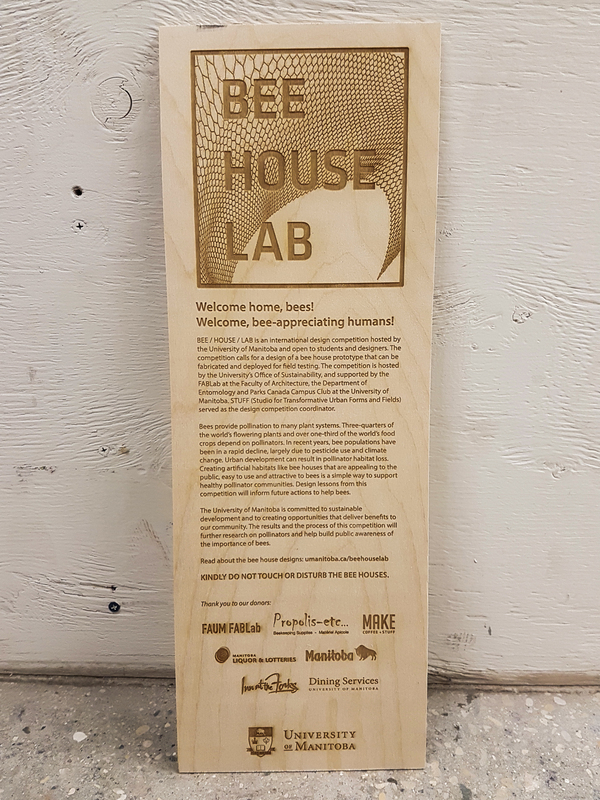 We then approached the FABLab, the fabrication lab in the University of Manitoba’s Faculty of Architecture, to discuss the possibility of creating bee houses. With this new partnership, an International Design Competition was born: BEE / HOUSE / LAB. 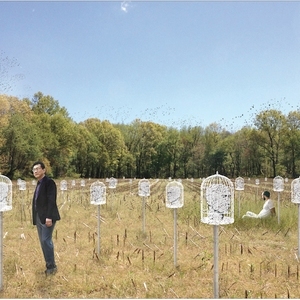 With the support of the Faculty of Architecture and STUFF (Studio for Transformative Urban Forms and Fields), an open design competition with categories for students and professionals was created to challenge designers to come up with a design of a bee house that could be fabricated and deployed for field testing. The final partner to be approached was the University of Manitoba Parks Canada Campus Club, a group of students with a passion for the outdoors. The student group was interested in supporting a campus sustainability initiative and excitedly jumped on board as a project partner. The student volunteers were instrumental in the installation of the bee houses. 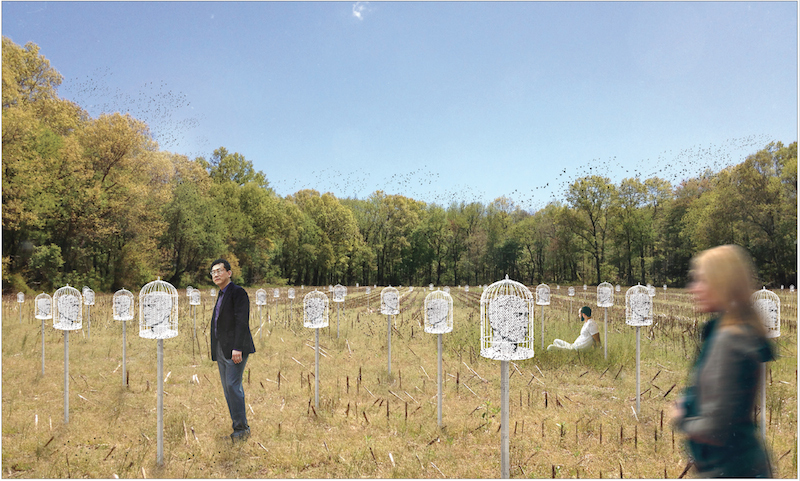 One of the main goals of this project was not only to create habitat to support bee populations but also to raise awareness of the important of pollinators and the threats they face. By making this an international design competition, we were able to engage people on a global level and get innovative and aesthetically pleasing designs that will help to raise awareness and encourage action. Further, by conducting research on these designs, we will be able to inform future action to support these bees. Another goal of the competition is to support the University of Manitoba’s aim make connections within the University and with the larger community. This project is helping to engage community by first creating partnerships on campus between departments, faculties and student groups; but also by partnering with organizations outside of the University as hosts of the bee house prototypes, including Le Marché St. Norbert Farmers’ Market, Manitoba's largest and best-known farmers' market; the Assiniboine Park Zoo; and The Forks, a popular destination in downtown Winnipeg. Finally, the University of Manitoba is committed to sustainable development and to using campus as a living lab that can foster research and create opportunities that deliver benefits to our community. The results and the process of this competition will further research on pollinators and the best ways individuals, communities and the world can support their much-needed resurgence. The project team includes representatives from the Office of Sustainability, the FABLab, the Environmental Design program, the Department of Entomology, the University of Manitoba’s Marketing Communications Office, the UM Parks Canada Campus Club, and STUFF. The project team worked together to create the project plan and was actively involved in every stage of the project. The Office of Sustainability is the lead partner on the project, initiating the project, bringing all partners together and coordinating the overall project. Several project team meetings were held over the course of the project to check in and plan next steps. STUFF and the Department of Entomology coordinated on the design specifications for the competition while STUFF acted as competition coordinator. STUFF managed the competition, including leading its design, recruiting and coordinating with the Design Jury, and fielding inquiries. The results were based on a blind jury, meaning that all identifying information about the design teams were removed from the submissions. A website was created, which was managed by the Office of Sustainability, who also managed the funds, including registration and sponsorships. The Office of Sustainability, supported by the entire project team created sponsorship packages and secured local sponsors to support the project through cash, in-kind donations and prizes for the winning teams. The Marketing Communications Office supported this project by creating promotional materials and informing media of major project milestones. Several media outlets, including several large local ones covered this project with stories online, in print, and on radio and television. Once the winners were announced, the FABlab began creating prototypes and interpretative signage for deployment. The Office of Sustainability and Marketing Communications Office planned a “House Warming” reception to showcase the winning designs. Tours of the Bee Lab in the Department of Entomology as well as the FABlab were organized. The Parks Canada Campus Club recruited volunteers to transport and install the winning designs at 13 sites. The Office of Sustainability coordinated permissions and fielded questions from sites. 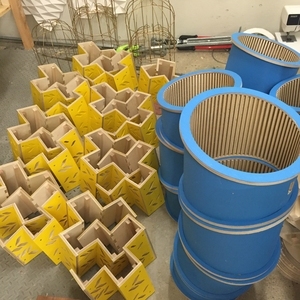 The Department of Entomology will research the designs and assess which prototypes and features are most appealing to the solitary nesting bees. This will help us create a cycle where we apply learning to continually improve upon the work. All costs for the project were upfront and there is no current plan for any recurring costs. Below is an outline for all costs and how the project was financed. PROJECT COSTS The following is a list of all project costs. The project has been very well received by the University of larger community. Many people are curious about the designs and several have approached members of the Project Team to ask if they can purchase the bee houses for their own use. Designers embraced this project wholly as is evidenced by the 21 innovative submissions received from nine countries. Approximately 50 prototypes of the top 5 designs were fabricated and placed along with interpretive signage at 13 sites around the University of Manitoba and in prominent locations around Winnipeg including the city’s largest farmers’ market, the zoo and a popular destination in downtown. These designs will be studied to further our understanding of these bees and how best we can support them. Media coverage has included stories from at least seven outlets, including 3 major local outlets (CBC, CTV, Winnipeg Free Press). Much of the success of this project can be attributed to its collaborative nature. Instead of it being run by one department or office, this was truly a collaborative effort that benefitted from the expertise of every partner. One lesson from this is to be open to contributions from anyone. For example, UM Parks Canada Campus Club, a group of students who share a love of national parks, isn’t an obvious partner but turned out to be enthusiastic and key to the project’s success. The successful partnership balanced the wins to ensure that every partner got something out of it, encouraging them to keep coming to the table. Additionally, all meetings were scheduled at the beginning of the project to fit with busy schedules and every partner took a turn hosting to give the partners more opportunities to learn about each other’s culture and strengthen connections. Meeting notes, including all decisions and the rationale behind them, were circulated after every meeting as well to allow the project to keep moving forward. This project is a combination of competition and creating something tactile, which made it exciting for the community. The project’s tight timeline kept energy and interest high. However, since innovative designs can be complicated to create, in the future more time should be built into this timeline for the fabrication stage. Tapping into the priorities of the University of Manitoba encouraged support and interest from the entire institution which helps with smooth implementation. However, it is important to think carefully about all possible stakeholders and how they can be engaged proactively. For example, the University’s groundskeepers were aware of the installation but information about the project and the types of bees to expect (docile, nesting bees) was not shared. While concerns were easily dealt with after installation, a proactive approach would work better in the future. Overall, this project has been a success and the project team is already planning next year’s competition.